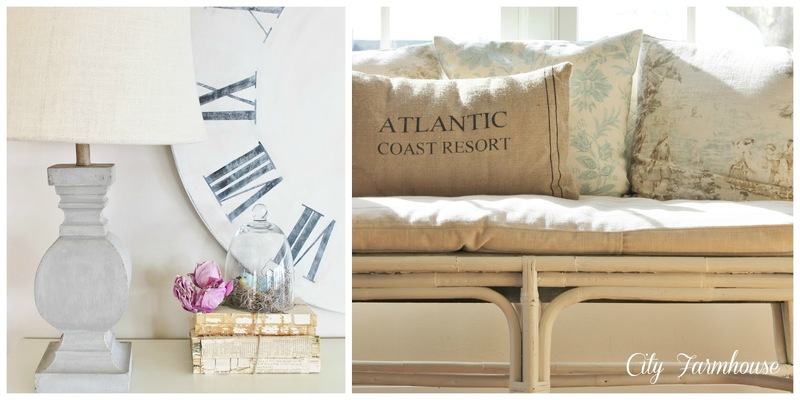 Hi friends of Savvy Southern Style! My name is Jen and I blog at City Farmhouse. Thank you Kim for asking me to be a part of this incredible series, I am honored. I adore Kim, she is so creative and talented and I think you will ALL agree, she has an amazing eye for style and detail. She was one of the first bloggers to reach out to me when I dove in head first last spring and for that I am so grateful. 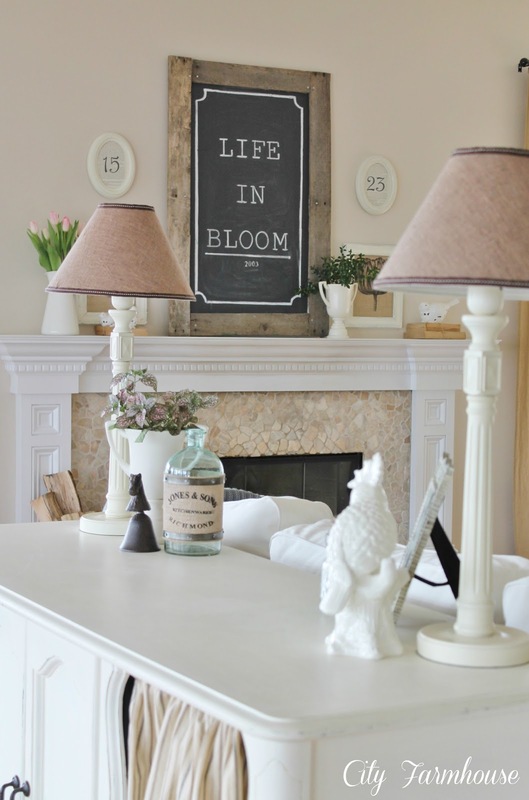 My favorite room....that would have to be my family room. It is the heart of my home and it is a space that sees it ALL. If the walls could talk they would speak of quiet & peaceful moments in the early morning, when the sun gleams in through the windows that overlook the bay, they would speak of days of chaos and excitement as 2 little boys grow, explore, learn and use their imaginations and they would also speak of nights of calm, where 2 friends still very much in love, find a few minutes alone by the fire while their fun seeking, happy little boys are fast asleep:). When we first moved into this home (after house hunting for a long, long time) I was in awe.I would get up early, come down to this room, open the shades and just take it all in. I would watch the sunrise over the water, each time it felt like the very first time and still does. This room is where our day to day moments of life are lived & cherished, it is a place we gather with family & friends, where we give LOVE and truly treasure the simple moments together. 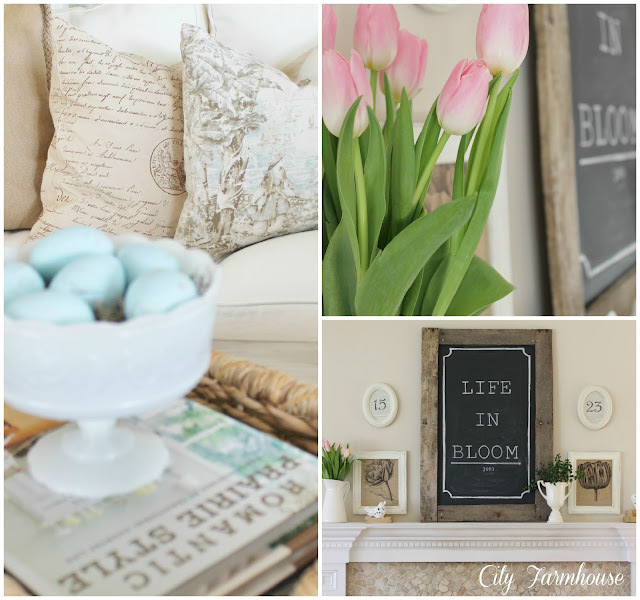 with little touches of spring. I am so grateful for the opportunity to share my home with you today. 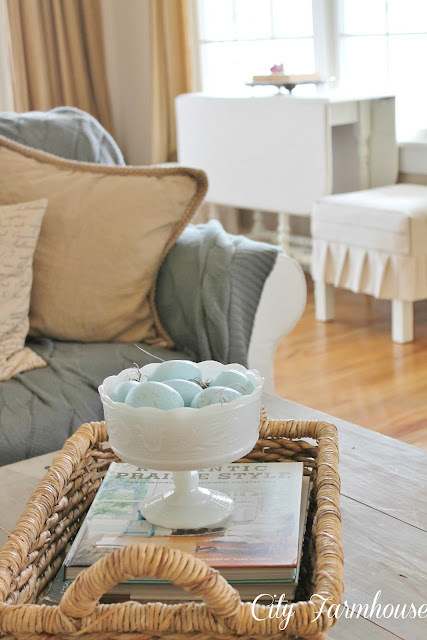 If you would like to read more about my journey or more about how I decorated this entire room on a budget, please come over to City Farmhouse for a visit, I would love to have you. Isn't Jen's favorite room beautiful? 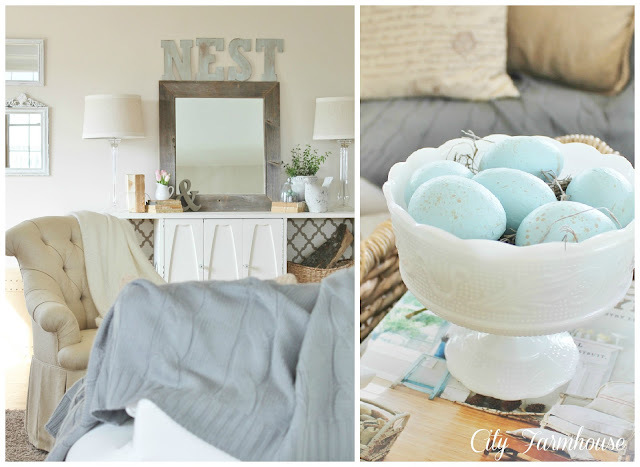 Well, get comfy and go on over to her blog, City Farmhouse for a whole lot more. If you have missed any of the past guest poster's favorite room you can find them all listed here. So easy to see why this is your faveourite room. It's washed in sunshine, so bright and airy... luvly. All ready for Spring. Oh what a comfy looking couch...great looking room! 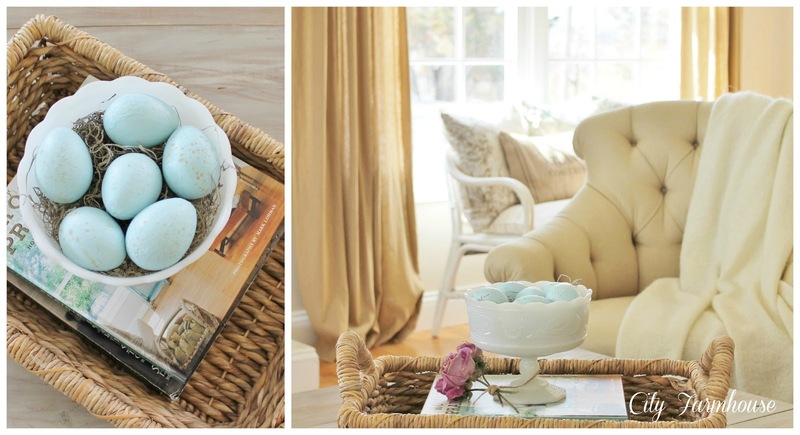 Oh I love Jen's home...and her favorite room is my favorite too....so beautifully decorated. I have always admired that buffet that she did. 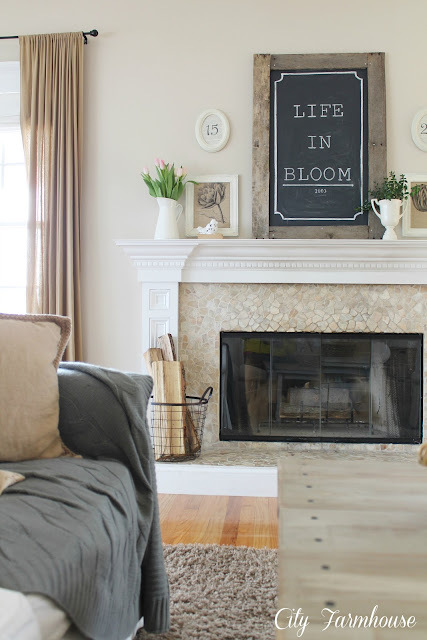 This room is just so serene...I can just imagine walking into the room and just sighing away..sigh!...Love the quote above the fireplace!! Thanks Kim for presenting Jen's favorite room...and you two have a great weekend of beautiful weather!! I adore Jen and her fabulous home! 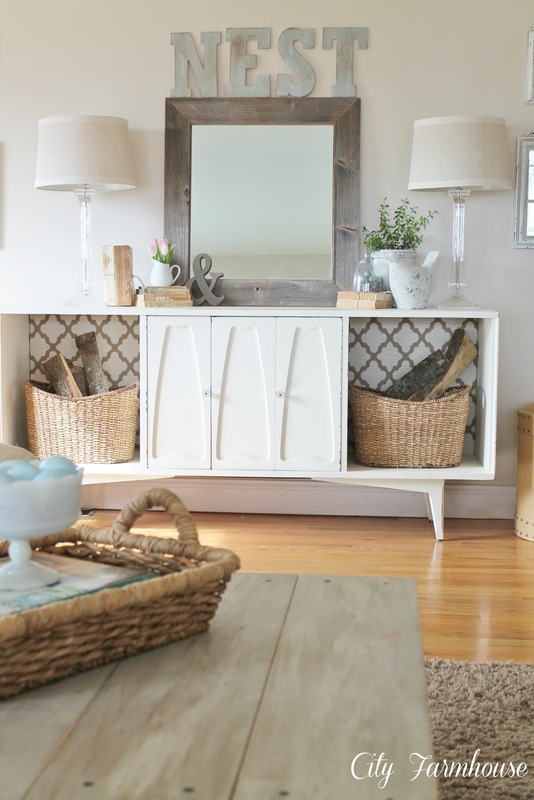 And that $10 thrift shop dresser makeover is amazing! It's absolutely beautiful! I love everything about it!! I enjoyed reading about Jen's favorite room.I can see why she chose this one it is beautiful! It's just beautiful! I love the neutral palette, the light and airy feeling, the touches of spring. It would be my favorite room too. Thanks for sharing her with us. I'm headed over now! It is beautiful! 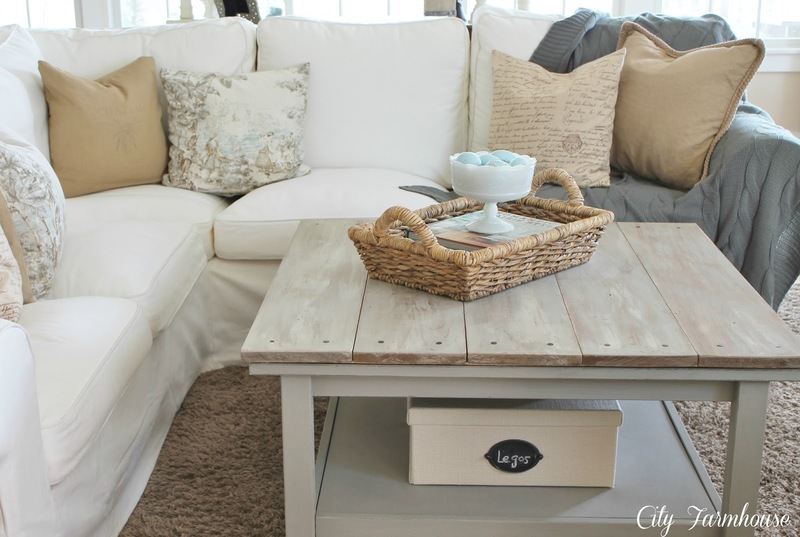 I love her coffee table. What a beautiful and restful room. Another wonderful room tour Kim. 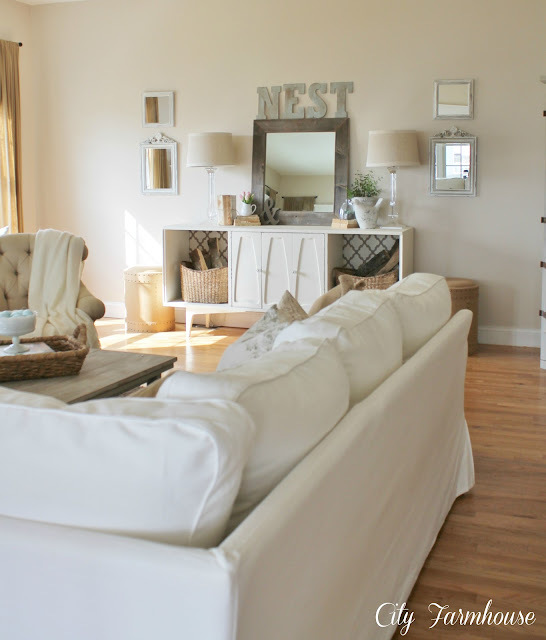 Jen has a beautiful home and I love her family room. It looks so pretty, yet comfortable and inviting ~ proving you can have it both ways. Thanks for sharing Jen's favorite room with us, Kim. So fresh and pretty! Great job Jen. What a gorgeous room! Lots of good ideas here. Great inspiration! What a perfect family room! I love all the windows and light along with the cozy feel! Just gorgeous! I can easily see why Jen love's this room. It is beautiful. So cozy and bright. 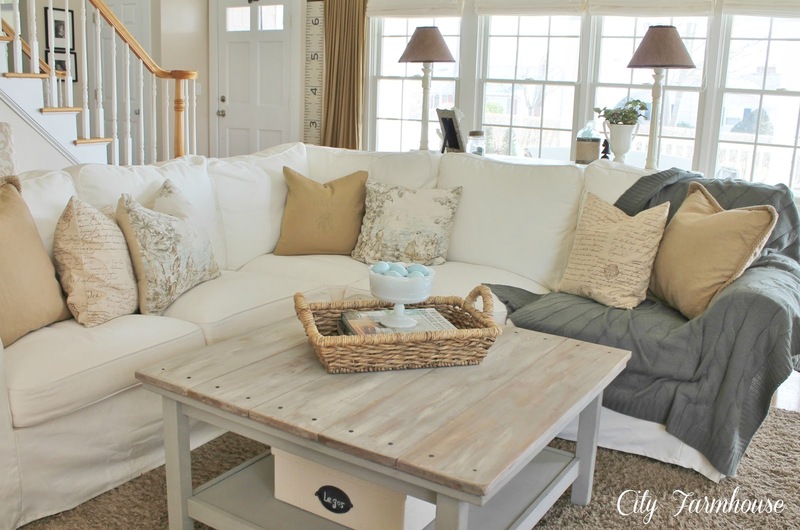 I would want to curl up on her pretty sectional and stay there!!! Gorgeous. Thanks Kim for sharing Jen's beautiful room with us. Another beautiful room! Thanks for sharing. I love the tufted chair! 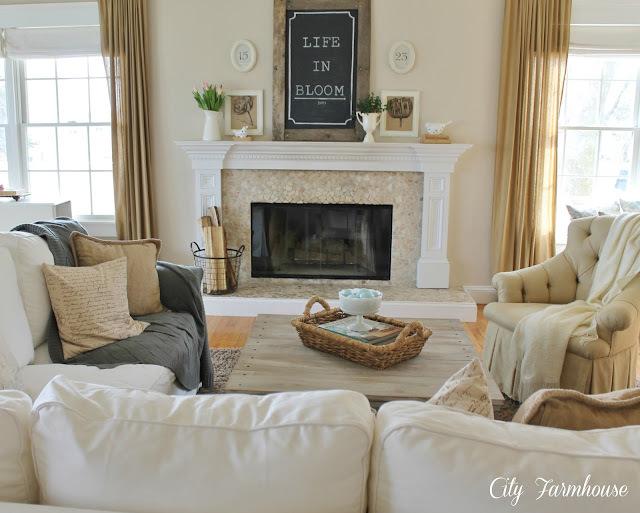 I love Jen's house and her family room is no exception! Great feature! Merci pour l'ensemble de ces merveilleuses photos... C'est vraiment une très belle pièce à vivre. Je vous souhaite une journée de la femme joyeuse et pétillante, gros bisous. What a beautiful room! It's springtime fresh and so inviting! I love the coffee table and that tufted chair is divine! What a beautiful room!!... 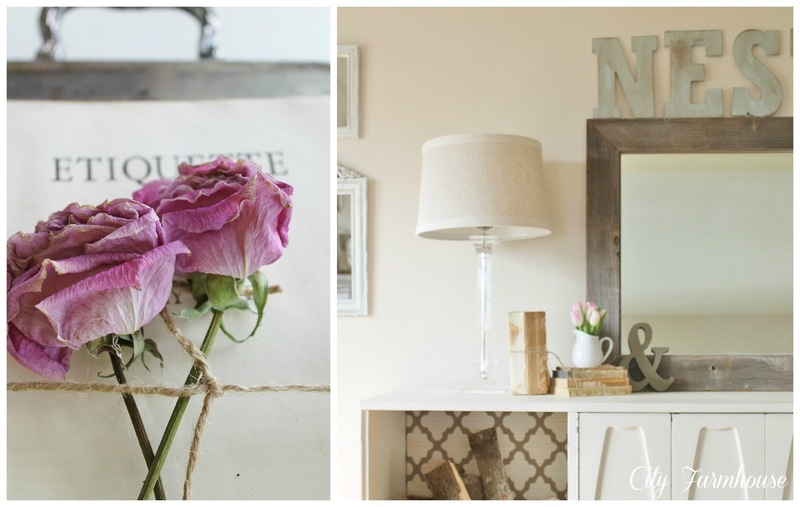 if I didn't have four dogs, I'd love to decorate with these muted natural hues... you've done a great job. 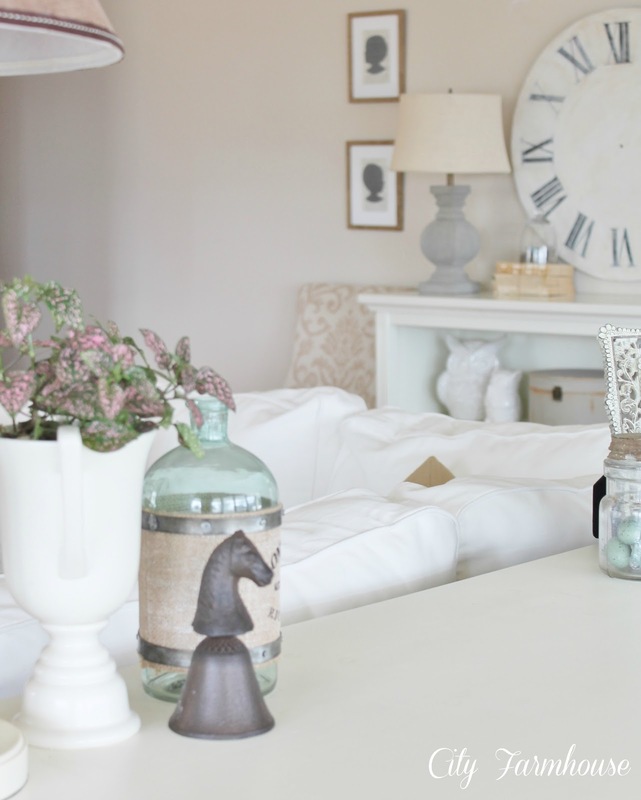 Hi Kim, Jen's room looks perfect on your blog. Two ladies with great style. Fun Friday! Jens room is so pretty. I love everything about it! Jen, you told your story with so much love and warmth! 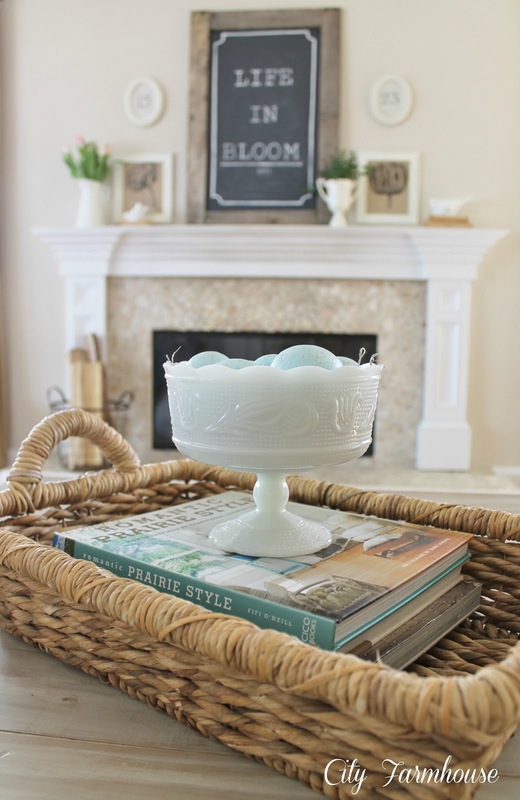 No wonder your home is so beautifully appointed! It's full of your personality! Your family room is so light and inviting. I adore the colors you chose and so skillfully mixed! 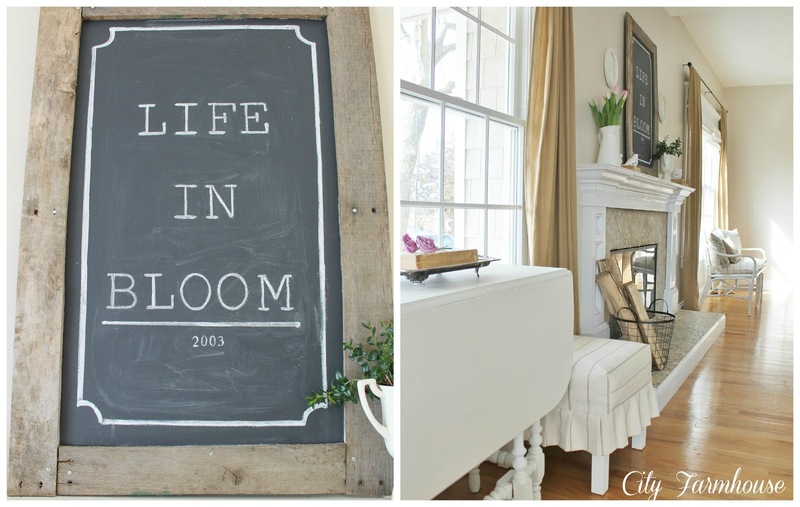 And your signs "nest" and "life in bloom" give words to what your home is all about! 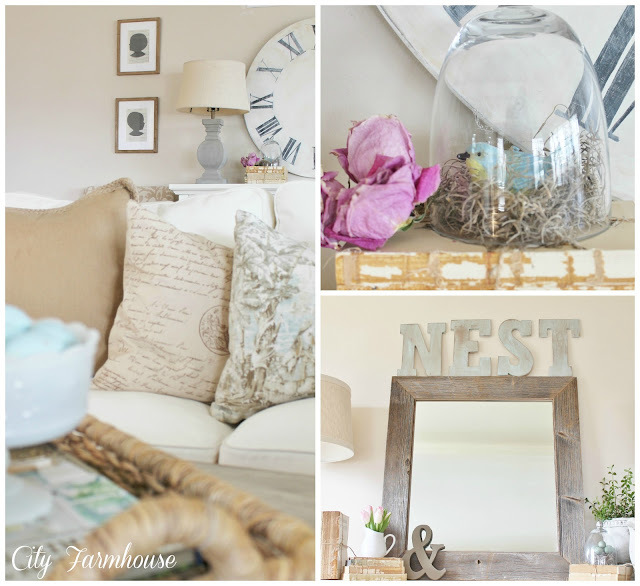 Kim, thanks for sharing Jen's gracious home. This was a very special visit!!! BTW~ I'm loving your sassy hair! Jen's family room looks so pretty, cozy, welcoming, and a great place to hang out! Such a pretty home and great photography. You know how to pick 'em Kim!!! I love Jen's style. It's so inviting and welcoming. 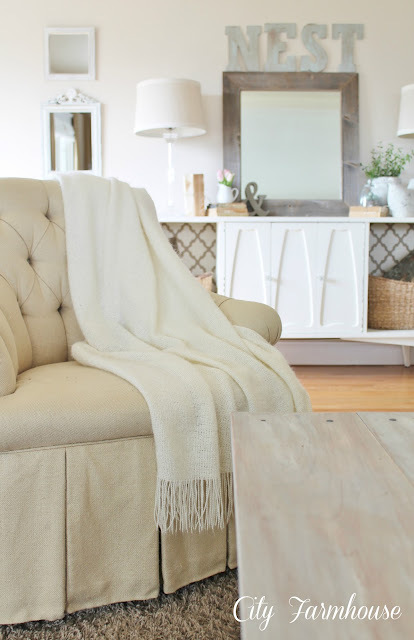 I want to plop down on one of the pretty soft chairs and curl up in one of the cozy throws! Love this room. I love Jen's room and am happy to visit it again! I love the character she added to her coffee table ... the fact that she's not afraid of slipcovers ... and, that she created such a beautiful and inviting space! Fabulous feature! I adore Jen and her blog... how fun to see her featured here today! 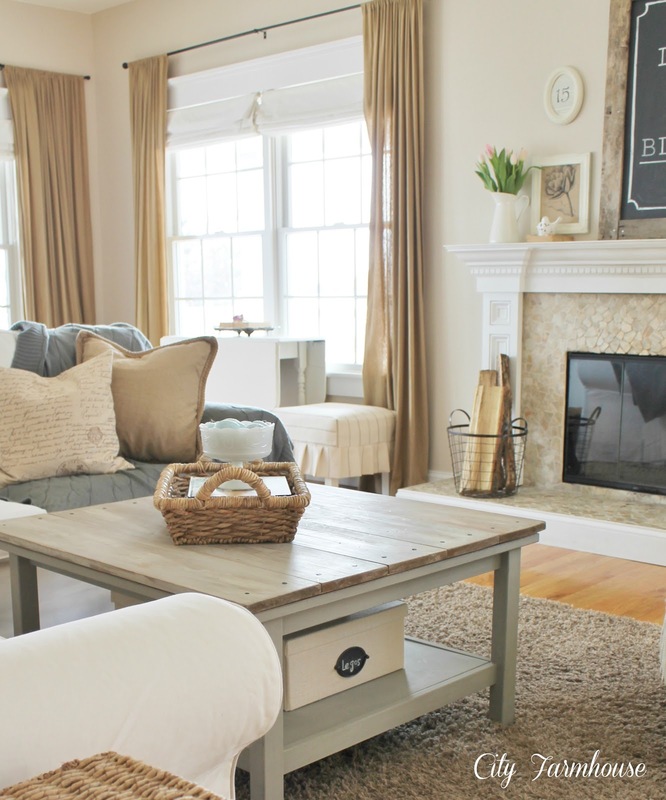 Her family room is just gorgeous... perfect in every way. Have a great weekend, Kim! Thanks for sharing this beautiful room. 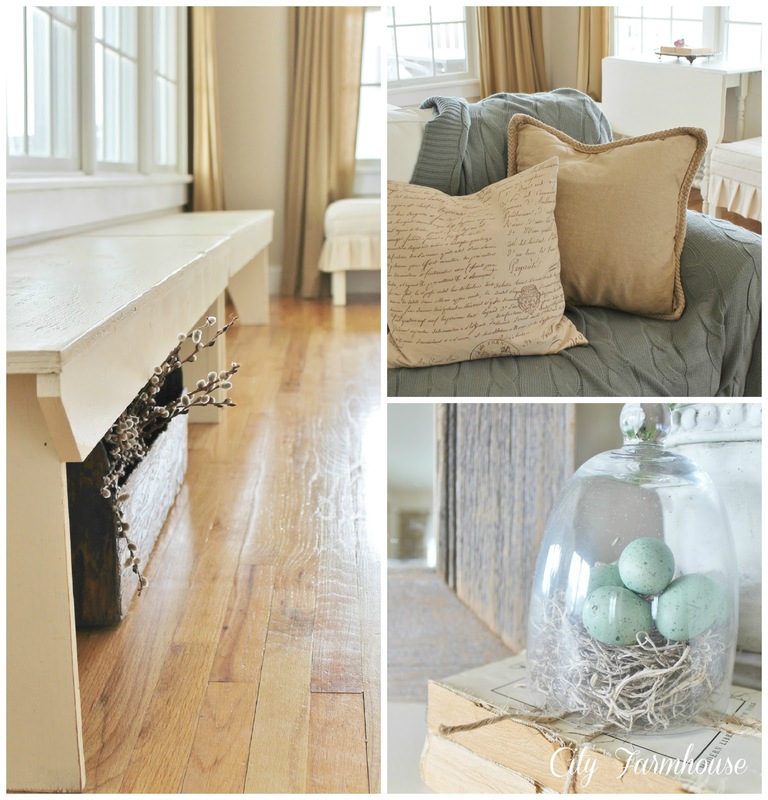 It's all the more special because of the love of this family and how they use this space. 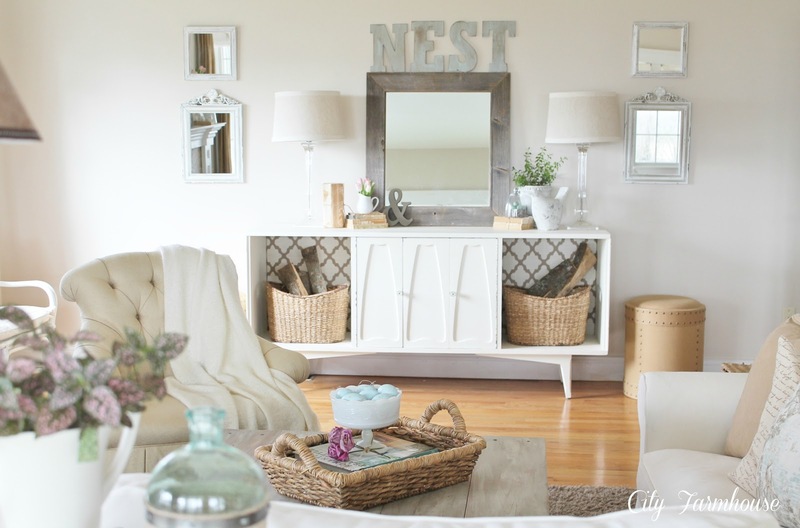 Thanks for sharing more of Jen's family room, Kim. So pretty and yet family friendly too. Such a beautiful light-filled room! It's wonderful and Jen did a great job!